a muslim homeschool: "Welcome Ramadan" colouring work book! I've put together an activity colouring book for K to do pre-Ramadan in order to teach her about this special month before it begins inshallah. I hope to also make a simplified one for Z because she will want to do the same as her big sister, so if I manage to get it done, I'll upload that too inshallah. Download your free copy of the Welcome Ramadan workbook!!!! I plan to explain each topic on each page and discuss, before K colours and writes to complete each section inshallah. It can either be put together to make a booklet (I printed mine A4 landscape) or could be used as worksheets I think too! .....I should have indented it inwards slightly on the left to allow punching into the margins....but didn't think about that till the end! Next time inshallah! Just to note: The ahadith referenced in the booklet are all from the English translation published by Darussalam. If I have made an error anywhere, please notify me so I can edit it! JazakumAllah khayrun. All illustrations are from google images. 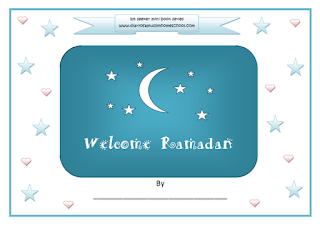 ****24/06/2012 Update***** I have now simplified the Welcome Ramadan workbook to produce a pre-school colouring book and can be downloaded inshallah HERE! MashaAllah, very useful. Jazakhillahu khair for all your efforts. jazakumullah khairan kaseerah for sharing all the wonderful ideas ,n free printables...this has really helped me in organizing kids activity during the tarwaeeh times in our masjid....i didnt have any help...my niyyah was to start something in our masjid n volunteer in arranging things n purchasing evrything was so expensive ..all my ideas came to live on ur website...thanks again from the bottom of my heart..
Jazakumullahu Khayran sister for such a valuable resource. May Allah swt ease all your affairs as you have eased ours. Looking forward to using these printables! !